I had my second session today! I was really disappointed because I didn't last as long as I wanted to in the chair. The first hour was fine, because he went back and shaded everything. But then when he started to colour over those raw spots, it started to kill. I have my next appointment for three weeks out, and I'm hoping it'll be easier because we won't go over the same spots multiple times. I can't wait for it to be brighter with more bright blues/yellows/greens. The top is going to be really light colours. I can't wait to get this finished...probably only two sessions left! 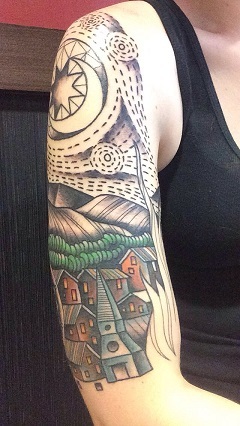 I'll take a photo of the inside/back of my arm later tonight when I get home and update this post! Oh wow. That's amazing. I absolutely love the colors in it. It's amazing! I can't wait to see it with all the colors. Love it so far! Can't wait to see it finished!